This article is from our Febooti archive, it was relevant then, and I think that it is still relevant today (a few details changed). 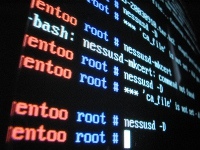 Previous article: Stopping a DOS batch file. With the information covered so far we are able to use batch files to make our lives easier, and help our day to day computing operations. However, we could make our batch scripts more sophisticated by avoiding the big limitation that we have been faced with so far. That is – our files are hard-coded (written in stone, so to speak) and if we want to manipulate a file, we have to change the batch script again and again. Either a space or a comma character separates each parameter. Both are treated the same. Now, how many replaceable parameters does the above line have? The obvious answer would be five. This would be wrong. DOS counts the name of the batch file itself as a parameter, so there are 6 replaceable parameters on this line. Much like other programming languages DOS names them %0, %1, %2, %3, %4, %5 rather than %1 through %5. DOS uses replaceable parameters as if they do not exist – for example, everywhere you see a replaceable parameter, the DOS sees the value of that parameter. When a batch script executes with ECHO ON, the DOS precedes each command in the batch file prompt. DOS treats the commands in the batch file exactly like it would if you entered them from the DOS prompt. :: Example with Replaceable Parameters. SHIFT changes the values of the batch parameters %0 through %9 by copying each parameter into the previous one. In other words, the value of %1 is copied to %0, the value of %2 is copied to %1, and so on. More in MS Help site. The SHIFT command discards the first parameter %0, moves the remaining parameters down one value, and brings in a new value if one exists. Therefore after the SHIFT command gets read, the value in %1 is moved into %0, and the value in %2 moves into %1 and so on and so forth. The SHIFT command really has two major purposes. First, by moving the parameters down into a lower replaceable parameter, a single replaceable parameter may be used for all coding by forcing the batch script to loop through the code. Second, it allows the batch file to handle more than nine replaceable parameters. The total number of replaceable parameters is constrained by the 127-character command line limitation (for old OSes), and starting Windows XP or later you can use longer command line – up to 8191 characters. A space, comma or semicolon is also a requirement to separate each replaceable parameter. 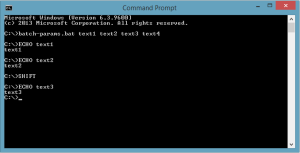 Next article: Loops in the Batch files with examples. Update Feb 21, 2015. Added link to the next article.